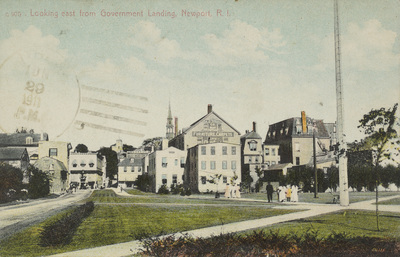 "Looking east from Government Landing, Newport, R. I." by Blanchard, Young & Co., Providence, R.I. Looking east from Government Landing, Newport, R. I. Used. Postmark: June 29, 1911. Blanchard, Young & Co., Providence, R.I., "Looking east from Government Landing, Newport, R. I." (1911). Rhode Island Postcards. 126.